TEHRAN -- "I came here to help develop Iranian baseball," an energetic Toma Irokawa, the first foreign manager of the Iranian national baseball program, told reporters at a recent news conference. Soccer and wrestling are wildly popular in this Middle Eastern nation, but there are only an estimated 500 people playing baseball. When asked about these scanty numbers, 24-year-old Irokawa replied that it "makes the job all the more worthwhile." Irokawa will also take charge of the 18-and-under youth program. "I want to train the next generation of ballplayers," he said, displaying his enthusiasm to open a new chapter in Iranian baseball. Irokawa first began to cast his gaze overseas when he was still a teenager, playing ball for Seiwa Gakuen High School in Sendai. 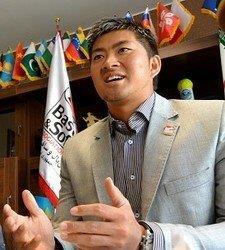 He credits his international baseball outlook to the influence of his former manager Zen Sato, who had coached baseball in Thailand with the Japan International Cooperation Agency (JICA). Irokawa says he learned not to get locked into old ways of thinking and acting, and to open up new paths. Sato's favorite slogan, "Make new baseball history," left a deep impression on the young Irokawa. In 2009, Irokawa journeyed across the Pacific, intent on breaking into Major League Baseball. He never made it onto a major league roster, but played independent team baseball in the U.S. He also played in the Mexican and Puerto Rican leagues until hanging up his spikes and returning to Japan in 2013. Though no longer a player, his transnational experience planted the seeds of his future. This past summer, Irokawa led a little league team drawn from Miyagi Prefecture boys aged 11-13 into the Latin American Baseball Classic tournament in Puerto Rico. He was apparently tapped for the job as he'd built up connections in the U.S. territory while playing there, and the organizers "wanted to invite players from the Great East Japan Earthquake disaster areas" to the tournament. Irokawa says he felt strongly then that "in baseball, anything is possible." Irokawa's first big test as manager of the Iranian team will come in February 2015, at the West Asia Baseball Cup. Though facing 2013 champion Pakistan and several other regional nations, Irokawa says he's hoping Iran will beat them all.